This tutorial aims to show a good technique for working out ideas in both a fast and readable manner. 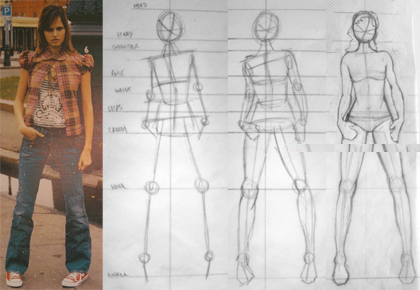 To be able to produce sketches which read as 3D objects, a basic understanding of perspective is required. For this reason the tutorial begins by giving a brief overview of the rules of one and two point perspective, including wheel ellipses. It then talks through three examples, all using different perspective viewpoints. Each one shows how to build a sketch from a blank page, through the rough line work, and finally simple colouring methods. Following all this collection of great tutorials on advanced drawing techniques, including general theory, useful tips, comic inspired art and some methods for transforming your creations into digital format. Discover a range of tips for drawing hands, generated from the artist’s own experiences. Techniques include foreshortening, drawing nails and finger shapes. Follow this artist’s personal recommendations and tips on creating your own characters. Drawing hair is hard work, but these useful tips you’ll be creating extremely realistic hair in your drawings in no time.